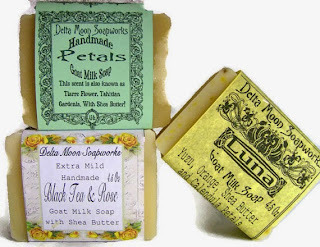 My LIfe as the "Soap Lady": Meeting a new "soap sister"
Meeting a new "soap sister"
One of the things I love best, about what I do for a living is the people involved in this way of life. From the crazy vendors I work with (we are really group of traveling gypsies! But we are also family) to the customers that become friends over the years, to the other people that are also soapmakers. The thing that I always think is so cool is that, by and large, it's more of a sisterhood/brotherhood, than a cut-throat type of existence. We will often share sources, or go in on supplies together to get the best price, and most of all, we are there for one another through the successes and failures. There are truly no real failures, because everything is a learning experience, so you still get to take something away. So today was great fun because I got to meet a new soap-sister! (Hey "C"). She's at the begining of the journey and I am so excited for the road ahead. I know she'll have so much fun discovering new techniques, favorite scent blends, suppliers and all the other good things that come with being a soapmaker. One of the things she'll get to decide, is if she wants to sell her soap online, venues like Etsy, Meylah or any of the others, there are so many out there. This leads to my hgelpful hint of the day. If you sell online, taking good, crisp pictures is imperative. Your customers can't touch or smell what they're looking at, so your pictures are all they have to go by. Here's a cool site that will help you edit your pictures. www.fotofuze.com You can see from this picture, the background has been removed and it looks pretty cool! Another fun one is www.picmonkey.com and you can do all sorts of neat stuff with that one! So after 14 years of doing this, I am still loving what I do, and loving that I can share information with my new "sister". Any of you that are thinking about making soap, DO IT! And welcome to the family! Thanks for the tips! And I remember when I met you at the Jack of All Trades Show last November. Your words to me where, " Welcome to the Sisterhood!" Thank you for those words of encouragement!